The YDX-6 core drilling rigs are reasonable in design, excellent in performance, easy for operation and convenient for maintenance. 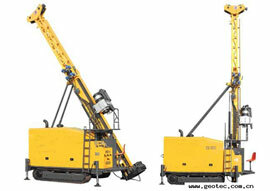 The core drilling rig equipped with tracks, has a hydraulic driving system. It owns a brief but advanced structure, with its power head driven by a variable motor and its speed adjustable for 2 gears. With the oil cylinder working with a speed-changeable chain, its performance is stable and reliable. The mast is adjustable in the range from 0° to 90° to ensure a proper hole-drilling angle. The low gravity center of the rig promises a steady operation. And it provides the operators with a convenient and comfortable working circumstance with a wide view. In short, the core drilling rig has a beautiful outline and shows a people-oriented design idea. The main parts and auxiliary equipment, including the engine, diesel engine, hydraulic pump, gear reducer and some key valves and hydraulic accessories, are all products with well-known brands. Big torque, powerful driving force, rational and practical design, advanced controlling mode and a 6-meter-long drilling rod guarantee the high operation efficiency of the core drilling rig. The diesel engine is professionally designed to reduce noise and other contamination (The noise can not be over 72db), which makes the rig proper to be operated in urban areas. The advanced technique of loading-sensor-controlling helps the rig reduce its consumption of driving force and heat discharge to the minimum extent. YDX-6 core drilling rig has an outstanding external appearance, a compacted structure, a reliable function, and a flexible operating system. All these factors have made the rig the best choice among the same products in the domestic market. Application Range of YDX-6 Core Drilling Rig: YDX-6 core drilling rig can be applied to both slant and vertical drilling. Being a rig equipped with diamond and the carbide alloy drilling, it can be used in the fields of geology, metallurgy, coal mining, nuke industry and hydrology measuring. Primary Pump Hydraulic pump: Axial Piston variable displacement Triplex pump for driving of rotator, winch mud pump & leveling jacks. With load sensing system. Maker DANFOSS II Pump, Gear type: 40 LPM at 300 Bar. Secondary Pump Axial Piston variable displacement duplex pump feeding oil for hydraulic Cylinder and control system. With load sensing system Make, Changyuan Hydraulic II Pump, Gear type: 30 LPM at 300 Bar. We are a professional core drilling rig manufacturer and supplier in China. We have gained the recognition of a large number of clients through our 20 years' production experience and marketing and serving experience, and meanwhile we have accumulated abundant experience in terms of products. At the same time, we keep researching core drilling rigs that can better meet the clients' needs and the market. Our core drilling rig has been exported to South America, Africa, East Europe, Southeast Asia, and Middle East. We have clients in America, United Kingdom, France, Canada, Australia, New Zealand, Philippines, Indonesia, India, Chile, Brazil, Russia, Algeria, Morocco, Malaysia, Thailand, Pakistan, Mongolia etc. Located in Wuxi, near Shanghai, the biggest port city of China, we are provided with convenient transportations of any kind, by land, sea or air, which will greatly reduce your transportation cost. To meet the clients' different demands, we can provide all kinds of geological drilling tools, such as diamond core bits (synthetic natural), reaming shells PDC bits, core barrels overshot, drill rods. If you need core drilling rig, please contact us.